Trout Unlimited’s Ashokan-Pepacton Watershed chapter. The progress has largely been due to the yeomen-like efforts of our EBD Restoration Committee — Peter Marx, George Markos and Lenny Millen, along with help and leadership from TU’s Northeastern Restoration Coordinator Tracy Brown and Catherine Skalda of the Delaware County Soil & Water Conservation District. Many others have assisted mightily with plantings and the like, and the work would not have been as successful without that help. But these five folks have blazed the trail for many of us to follow. 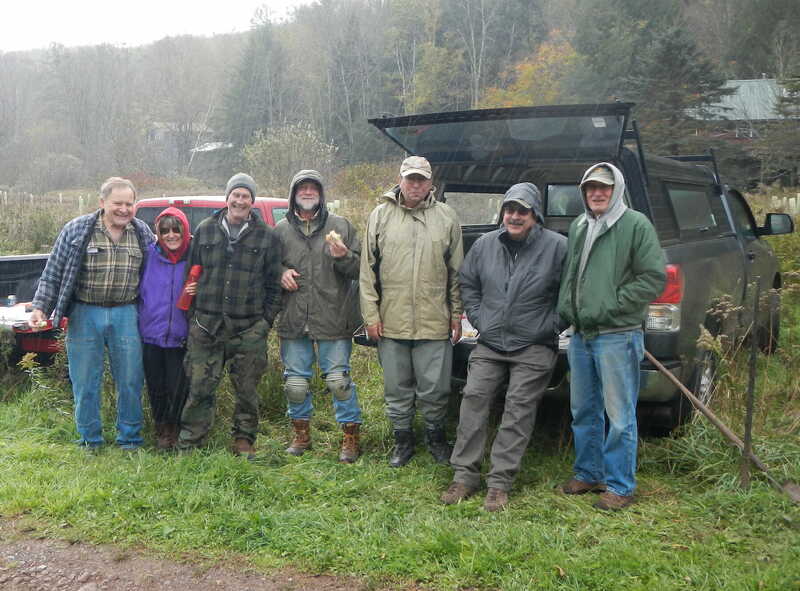 The weather was wet, foul, and quite raw on October 20, but a hardy handful of chapter volunteers showed up to plant trees and shrubs along the East Branch near Halcottsville. This was the chapter’s second such planting in 2018 and fourth over the last two years. Catherine reports that during the last two years the chapter, in partnership with the Arbor Day Foundation and the New York City Department of Environmental Protection and the DCSWCD’s Catskill Stream Buffer Initiative, has planted a total of 783 trees and shrubs along the East Branch. 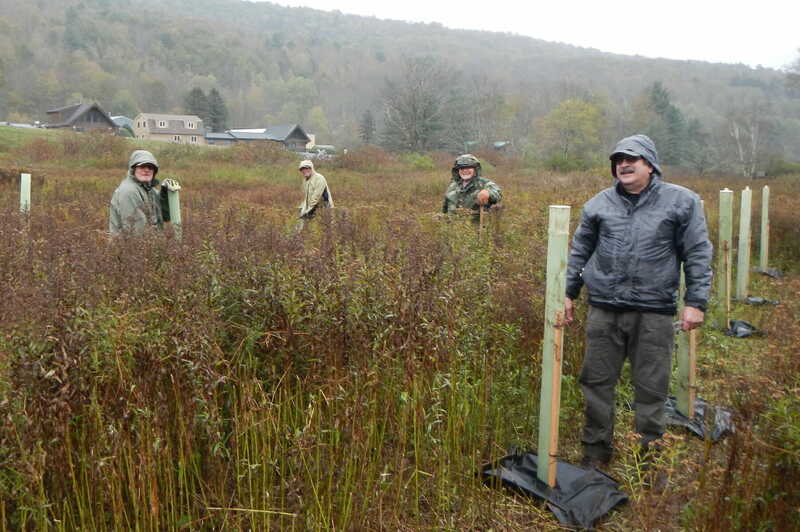 The Oct. 20 tree-planting drew a handful of hardy volunteers. They were (left to right) Jody Hoyt, Dana Hensley, Chris Hensley, Lenny Millen, Peter Marx, George Markos, Tony Cocozza and Catherine Skalda, who is not pictured because she took this photograph. In addition to the tree-planting, Lenny, Peter, and George removed 11 of the 12 water temperature loggers that had been strategically placed in the East Branch from the Hanah Mountain Resort & Country Club upstream to Roxbury. With the aid of a newly purchased underwater optical viewer, Lenny was able to locate and retrieve the 12th logger. George has begun the tedious process of downloading water temperature data these loggers captured during the last four months. This marks the third consecutive year the chapter has been studying East Branch Delaware stream temperatures upriver of New York City’s Pepacton Reservoir. Additionally, George and Lenny assisted New York State Department of Environmental Conservation Region 4 fisheries staff, with help from Trout Unlimited’s Pennsylvania field crew, capture and tag 292 trout in September as part of an ongoing telemetry study funded by DCSWCD as part of the NYC DEP Stream Management Implementation Program.